Shirts With Random Triangles: Iowa HC Kirk Ferentz was called "Fetus-Head" by high school teammates. 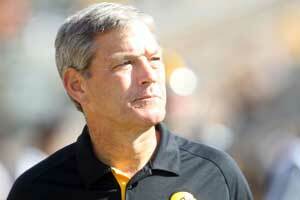 Iowa HC Kirk Ferentz was called "Fetus-Head" by high school teammates. Uh, excuse me, getting a little off course there. Anyhow, Iowa head football coach Kirk Ferentz was asked by the Des Moines Register if he had an embarrassing nickname in high school or college. Naturally, he did. It was also one so spectacularly embarrassing that it probably blows your being called something rude and obnoxious out of the water. Why? He was called "Fetus-Head." “Fetus Head, that was one. Helmets didn’t fit so well back in the day. I’ve got a head that’s kind of shaped like an almond, I guess. So, yeah. I used to have a big lump that would form over my head (pointing to bridge of nose). That probably explains some of my problems and my issues right now — 35 years later. Well, that probably beats what you were called in high school by a mile. You can imagine Iowa fans who haven't been too happy with Ferentz record over the past couple of seasons will be storing that one away for next season.